"I don't even suspect the presence of baking soda." Cats spend a large portion of their few waking hours cleaning themselves. Even with their focus on personal hygiene as regards their coats, their waste still leads to unpleasant odors. Harsh cleaners may be dangerous for pets, and mild ones won't fully remove the source of the smell. Certain deodorizers can minimize odors safely and effectively, from the litter box to the carpet. The Humane Society recommends enzymatic cleaners to remove odors associated with cat urine from fabric such as carpet, bedding or clothing. Enzyme-based spray cleaners work by breaking down the proteins in pet waste that ultimately lead to odors. Cat urine resists many other types of cleaners because the cleaners remove the odor without removing the food source for the bacteria that cause it. As long as the proteins remain in a fabric, the odors will return. Pet stores carry an array of enzyme-based cleaners. Cats do not typically like artificial scents associated with scented litter or commercial household deodorizers. Your cat won’t enjoy the dreaded bouquet-and-cat-waste scent combination any more than you do if you attempt to overpower the smell of a litter box with an air freshener. Instead, neutralize cat odors before they start. Mix a bit of baking soda, known for its odor-absorbing properties, in with the cat’s litter. The inexpensive powder is safe and recommended by the Humane Society. Each type of litter has different odor-control properties, so you may need to experiment to find one that works for your cats. Alternatives to the most common form of litter -- clay -- include paper, wheat, sand, pine or corn formulas. Some brands of cat litter contain baking soda, combating odors without any additional work on the owner’s part. 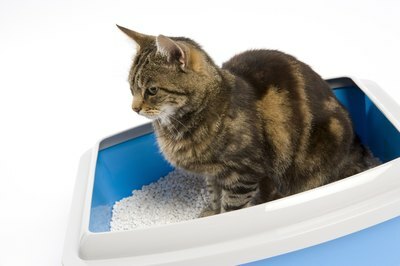 Products sold as litter box sprinkle typically consist primarily of baking soda, along with added scents or texture agents. Ammonia-based cleaners don’t work too well to deodorize cat boxes, bedding or any other items your cat may contact. Because feline urine contains substantial amounts of ammonia, the scent encourages further urinating and leads to ongoing smells. Steam cleaning a fresh stain also poses problems, as the heat traps the scent in the carpet fibers. Instead, thoroughly clean the stain with enzymatic cleaner before using heat-based cleaning methods.